What Counts As A Video View On Social Media? Whether it’s Live or recorded, on Facebook, Instagram, YouTube, Twitter or Snapchat, video is everywhere. But how can marketers really measure its success? There is no doubt video is the sexiest form of content for marketers nowadays. And it’s well deserved as video is also one of the most engaging content form on social media. Mark Zuckerberg said it before, he truly believes video is the future of Facebook. And I’m convinced Kevin Systrom, Evan Spiegel and other founders and CEOs agree. 2015 saw the rise of online video, 2016 saw the boom of Live broadcasting. There is absolutely no doubt the future of online marketing will come through video. But there’s still a big issue in the mind of most marketers: how can we truly measure success? How do we know our videos are really performing well? How can we really measure success when it comes to video on social? The task isn’t easy. For one, not a single platforms shares the same criteria when it comes to counting a view. Facebook says a view is 3 seconds, YouTube wants at least 30 and Snapchat counts a view as soon as a video starts playing. And then add the fact that some platforms auto-pay videos and others don’t. Thankfully, the good peeps of Buffer put together a super useful guide to video metrics. The below infographic will not only help you understand how the different platforms count a view, it also shows you the difference between different formats within platforms. 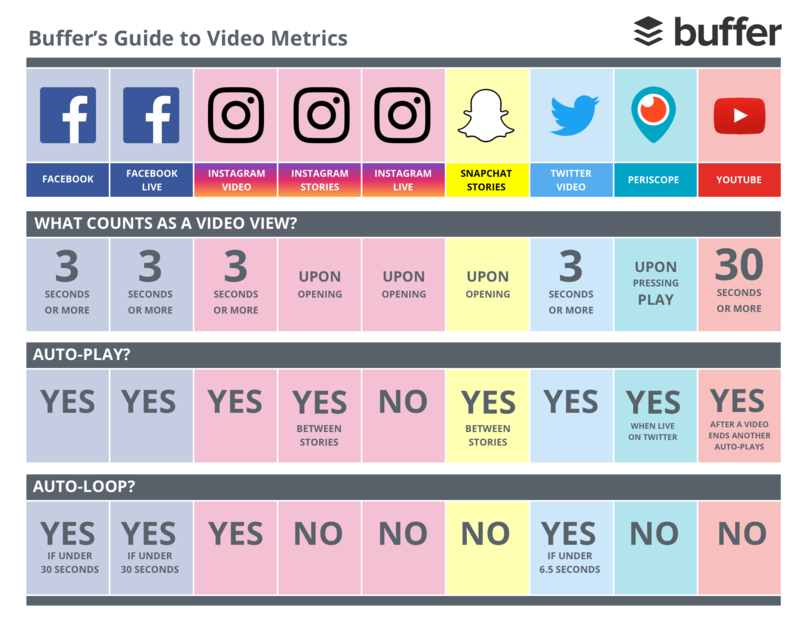 Check out this amazing guide to video metrics by @buffer!